In this planting of mustard and succulents the succulents are more permanent and the mustard is a filler along the path. The mustard and the Cotyledon have different watering requirements. 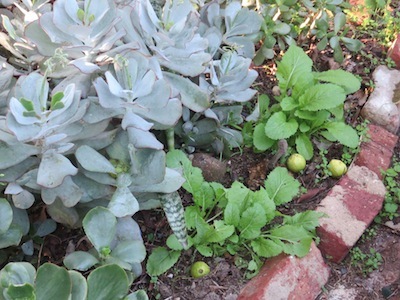 I hand water with a watering can of grey water between the mustard plants, avoiding putting water near the succulent. They both seem to be thriving, so happy together. There are indigenous mushrooms everywhere too.